Companies will often get government contracts and outsource a workforce from somewhere else to come in and do the job, often from one nation to another. But many companies become slave-drivers as they reap the profits from the labor of others. They become human traffickers. Human trafficking encompasses many dark ways of using people to make money. Human trafficking in illegal workers is a lucrative way to prey on and exploit those who need work, and are often desperate to work. As I recently wrote about, DynCorp and it's subcontractor Global Linguist Solutions (GLS) being sued for treating American citizens working as military translators in the Middle East like slaves. They have been forced to live in slave-like conditions and continue to work, under threat of being imprisoned if they try to escape their deplorable conditions. Kuwait was where GLS was subcontracted work by DynCorp to hire translators. Kuwait appears to be a key zone for human traffickers to run their cons and treat people like slaves as they get paid by government contracts. 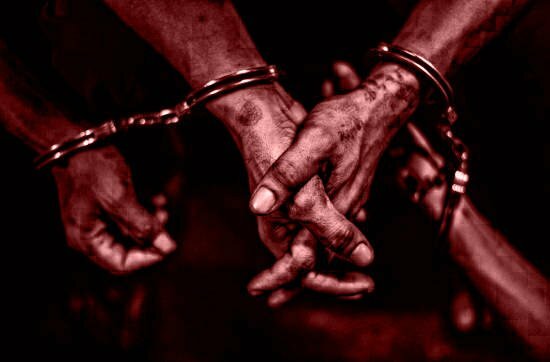 And the Middle East Monitor has reported on Friday November 2 that the Kuwaiti Ministry of Interior has issued a wave of arrests for 2,900 foreigners from various nations as part of the biggest human trafficking case in it's history. It started off with an investigation in people paying money to imaginary companies that signed contracts with different governmental agencies. Over the past few days, 90 arrests were made where these people confessed to engaging in such activity in order to keep working in Kuwait illegally. Three company owners were part of the investigation and subsequently released on bail by Kuwaiti Public Prosecution. They were responsible for bringing in nearly 3,000 workers with falsified work visas. The mastermind behind it all appears to be a Syrian expatriate. He attempted to get the paperwork done for 3 imaginary companies with government agencies in order to get the large number of people into the country to work illegally. A few days ago, a surprise inspection in Jleeb Al-Shuyoukh was carried out by General Department of Residency Affairs. This is where, during the inspection, foreign workers were captured who had fake residencies issued by government contracts to the 3 imaginary companies. Asked why they were working illegally there, instead of where they had been designated to work, the detainees said they had paid money in order to get entry into Kuwait through being given visas and allowed to work anywhere they wanted. But that was not how the work visas functioned. The detainees thought they were legally working in Kuwait, but unwittingly admitted to being illegal workers. Thanks to their admission, the General Department of Residency Affairs looked further into files for the 3 fake companies that had hired these foreigners for work in Kuwait. That's when they found that the listed headquarters of each located in different cities (Kuwait City, Al-Farwaniyah and Al-Ahmadi) were closed and out of service. Further investigations revealed the number of workers that were hired by these imaginary companies exceeded the declared number provided to the government. Instead of hundreds, there were 3,000 foreigners from different nations brought in to work illegally. But, it appeared legal, as they all had government contracts which allows them to come to Kuwait. Looking deeper into the foreign workers, the General Department of Residency Affairs found that all of them were linked to a Syrian expatriate that masterminded the whole human trafficking scheme. They soon found him and arrested him, and learned he had good relations with some government officials who helped him to make these contracts through fake companies an obtain visas for the 3,000-strong workforce. The main source of humans trafficked for illegal work in this scheme come from Pakistan, followed by Bengal and then Egypt. Each Pakistani reportedly paid about $9,870 for the opportunity to come work in Kuwait. None of these arrests are tied to the slave-driving of DynCorp and GLS though. Why would Kuwait not go after a known human trafficking operation that's been ongoing for years and where there is a trial in American courts? Maybe they Kuwaiti government is careful not to go after (or afraid to go after) powerful American-based companies that also traffic in human workers and treats them like slaves, bullying them to keep working in Kuwait illegally, forcing them to live in deplorable conditions. Maybe there is too much money involved, and too many government officials being paid to look the other way. The recent #deepdives contest was about human trafficking. If you want to check out some of the submissions, please go here. As a child of immigrant parents who came to Australia with nothing, my parents worked from dawn to well past midnight. Apparently, dad used to fall asleep on the toilet because he was so tired. I still remember trips to the tip as a child where we’d scavenge for stuff. But we were lucky, we were always together, they took us everywhere. I don’t even know how they managed with 4 kids. They saw being employed as a great opportunity, so I can appreciate the desperation and feel a lot of empathy for these poor people who just want to feed their families. It makes me so sad to read about this stuff. I suspect that there was some level of intelligence agencies involvement, using it as a front as well as another illegal money machine to fund their off the books programs. I am not a fan of the fact that so many foreigners (2900) are being arrested. Seems from your reporting they did not know they had been duped, and the fact they were let in the country and able to work and such would have aided in that perception it was on the up and up. Seems to me that they would be treated as victims, since that was what many of them likely are. So many places in this world needing fixing and yet many wealthy nations are quarrelling on the most trivial things! Hello there @krnel great to see this subject being hit here so well ! DYNCORP are a disgusting organisation and their crimes are manyfold and there hands are covered in blood since a very long time ! Will be good them reap their just rewards once the sealed indictments are opened ! they are on the list i am sure ! Yeah, I hope they lose the lawsuit against them. Yes well I am I was sure that you would be like me hoping to see them get what they deserve ! I do not know for a fact that there board of direction is on the list of people to be investigated, but seeing that Trump has with the movement Q opened up a can of worms concerning the trading of human beings and so Dyncorp being one of the biggest offenders in this domain simply must be on the list ! Lets see how this all pans out after the midterms @krnel !! Yes, I've heard about this over the years & if memory serves, I talked to a guy who was held prisoner there & finally he got out. They take away their passports. They do that in China too. There are plenty of Americans & Canadians who bring over girls from many countries to work as nannies or housekeepers & hold them hostage too, not to mention they abuse them. Yup, they are so.immoral. leave u there without a way to.get.out, illegally working as.a slave. The part about Americans was.from. a previous post on Dyncorp. I'm pretty sure a significant part of the middle east has been built by abducted slaves! Most of us are economically desperate & being exploited. Maybe not to the same degree as they were, but this is a WORLDWIDE epidemic. Your UA account score is currently 7.293 which ranks you at #66 across all Steem accounts. In our last Algorithmic Curation Round, consisting of 236 contributions, your post is ranked at #14. Shocking! people think slavery is a thing of the past when they don't even know half of the horrors going on in the modern world!